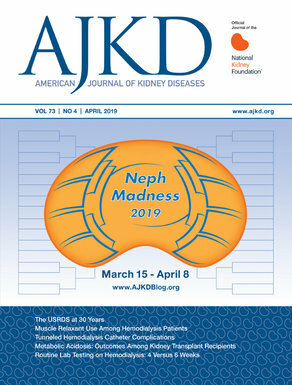 NephMadness 2016: Last Day to Submit Your Brackets! The deadline to submit your bracket for NephMadness 2016 is today (March 23) at 11:59 pm EDT. Fill out your bracket before time runs out! What happens when game officially starts? You will no longer be able to submit a bracket. But, the contest doesn’t end at that time. The Madness (and learning) is only beginning. The Saturated Sixteen results will be posted at Tourneytopia on Thursday March 24th. Instantly every entry will be scored and sorted from highest points to lowest based on how everyone matches up to the blue-ribbon panel. An e-mail will go out with the updated standings and it will tell you where you stand in the pack. Also, at this time AJKD Blog will post explanations and summaries of all the results. *First registration question must be answered for prize eligibility. See scoring & rules.